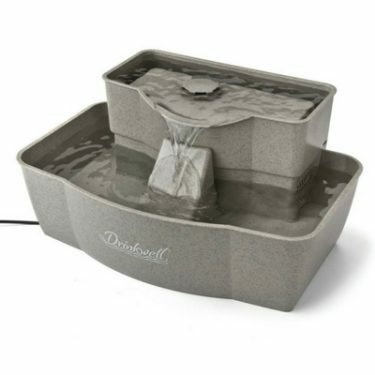 The PetSafe Drinkwell Platinum Pet Fountain is a relatively compact, sleek-looking, gray plastic fountain. It has an extra-large capacity of 168 ounces. This fountain is unique in that it has an external reservoir that gravity feeds the fountain when the water level drops. The fountain is operated by a 12V electric pump that can run continuously for several years if it’s properly maintained. The PetSafe Drinkwell Platinum Pet Fountain comes with a carbon filter that will need to be replaced monthly. The fountain also has a pre-filter that catches hairs and other debris. 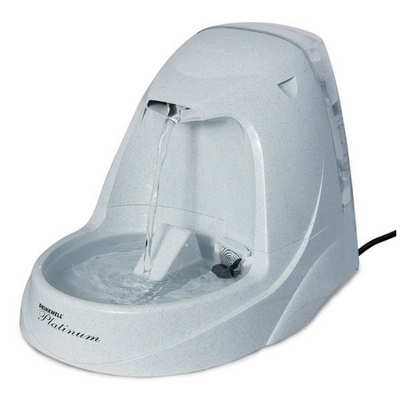 The flow setting can be adjusted by a small lever on the face of the fountain. The fountain is designed to mimic the flow of water from a standard household faucet. The large basin has a sloped ramp to minimize splashing. The fountain dimensions are 11″W x 16″L x 10.5″H. 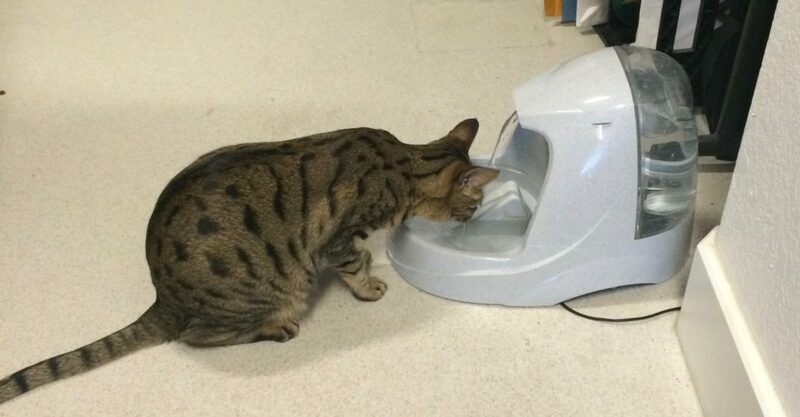 From your cat’s perspective, the PetSafe Drinkwell Platinum Pet Fountain is perfect. 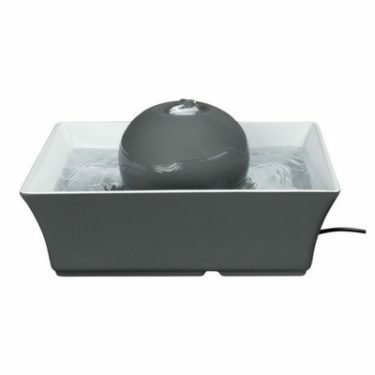 Cats love the free-falling water stream and the large bottom bowl. 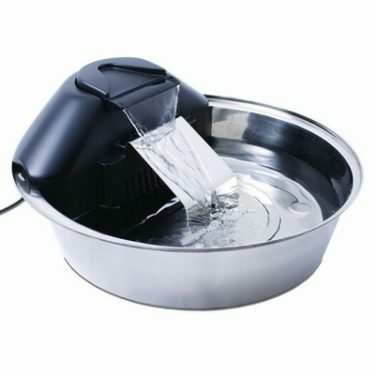 The fountain does an excellent job of circulating water and the filter design keeps the water tasting fresh. 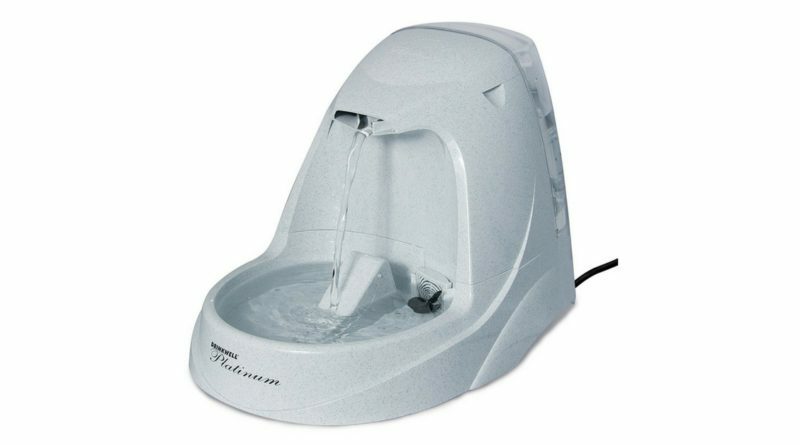 We’ve had 2 Drinkwell Platinum Pet Fountains that’ve lasted about 5 years, which is a good amount of time for a plastic fountain. We have a love-hate relationship with the Drinkwell Platinum Fountain. 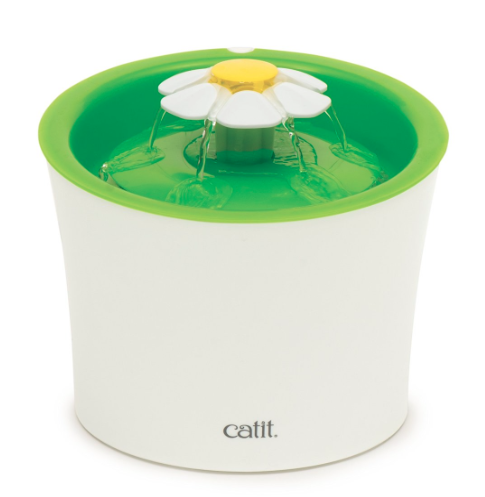 We love it because our cats love it and because it doesn’t need to be refilled as often as other fountains. We hate it because it is a huge chore to clean. This is definitely a functional fountain, but it has the potential to be an incredible fountain with some minor design improvements. As long as this fountain is operating with enough water in the basin, the submerged motor is pretty quiet. You might have to adjust the flow settings here and there to get rid of the splashing sound. 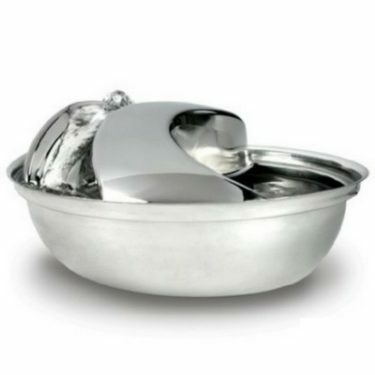 Overall, the PetSafe Drinkwell Platinum Pet Fountain is quieter than average. 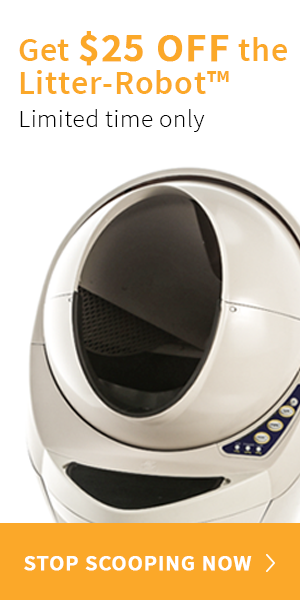 Our main complaint with the PetSafe Drinkwell Platinum Pet Fountain is that it is a pain to clean. Even after purchasing the specialty cleaning kit, it is still a nuisance to clean due to the many small crevices and multitude of parts. But we highly recommend purchasing this cleaning kit if you have this fountain or any of the Drinkwell Pet Fountains. The pre-filter does a decent job of catching large debris and hair, but you’ll probably still need to clean this fountain at least monthly. In addition to dissembling the fountain, your cleaning routine will also need to include fully dismantling the pump motor. If you skip this step, you might find yourself with a pretty big mess to clean up when your fountain overflows. On the plus side, this fountain is very easy to refill. 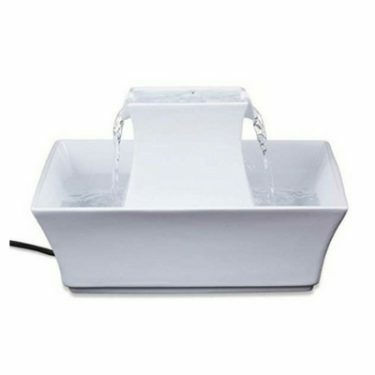 The storage basin can be removed without turning the fountain off. The filter is also very easy to replace. Simply take the housing lid off and slide in the new carbon filter – the black side of the filter should face forward. 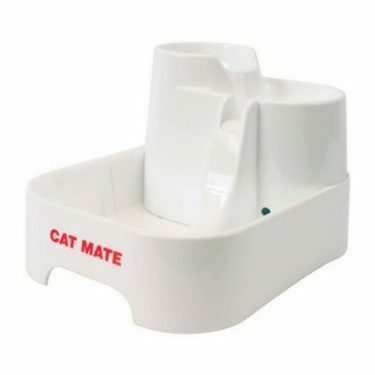 The PetSafe Drinkwell Platinum Pet Fountain continues to be a best-selling cat fountain because of its reputation for being a top-quality product. After 5 years on continuous use and infrequent cleanings, our Platinum Fountain pump finally died. Our other 5 year old Platinum fountain is still running with the original pump but the fountain is due for replacement because the plastic has accumulated a bunch of scratches and is collecting bacteria. This is pretty typical of plastic fountains. 5 years is definitely more than we expected to get from a plastic pet fountain. 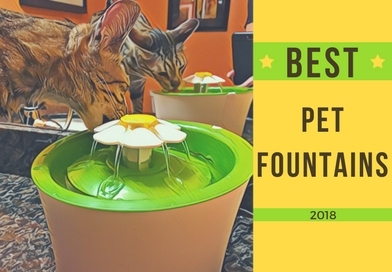 Despite being one of the most difficult fountains to clean, the PetSafe Drinkwell Platinum Pet Fountain is still one of our top-rated pet fountains. 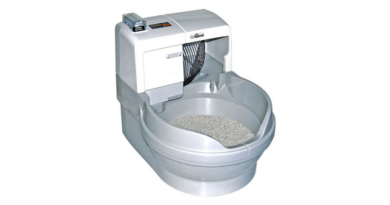 Its large capacity reservoir, easy to change filters, quality pump, quiet operation and cat-friendly design make it easy to overlook some of its shortcomings. 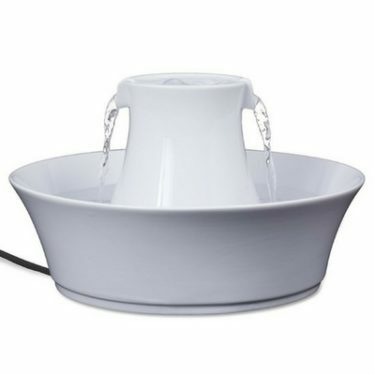 We recommend this pet fountain for multi-cat families and for families that need a reliable source of drinking water for their cats when they go on vacation for several days. The manufacturer recommends replacing the carbon filter every 2 to 4 weeks. The carbon filters that are designed to be used with the Platinum Pet Fountain are the 6-chamber filters that are black on one side and white on the other. The dual-cell filters will not fit in this fountain. 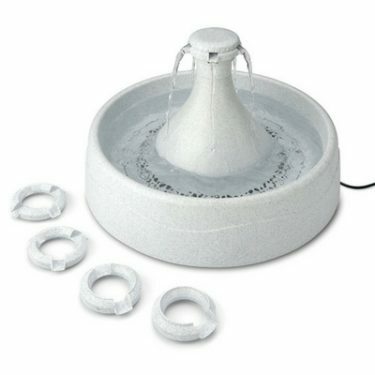 PetSafe has replacement filters specifically intended for the Drinkwell Platinum Fountain for about $2.00 each. 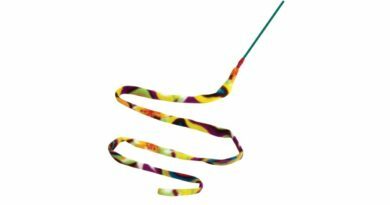 Click here to find them on Amazon. 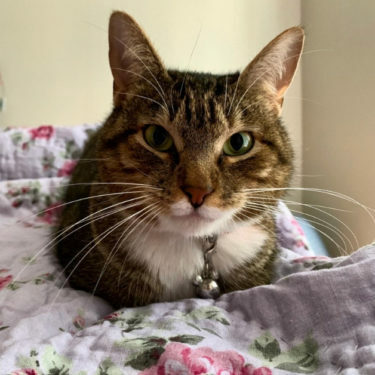 We recommend getting the off-brand filters which are virtually identical to the PetSafe filters, but cost less than half the price. We’ve been using the off-brand filters in our fountains for years and have never had a bad experience. 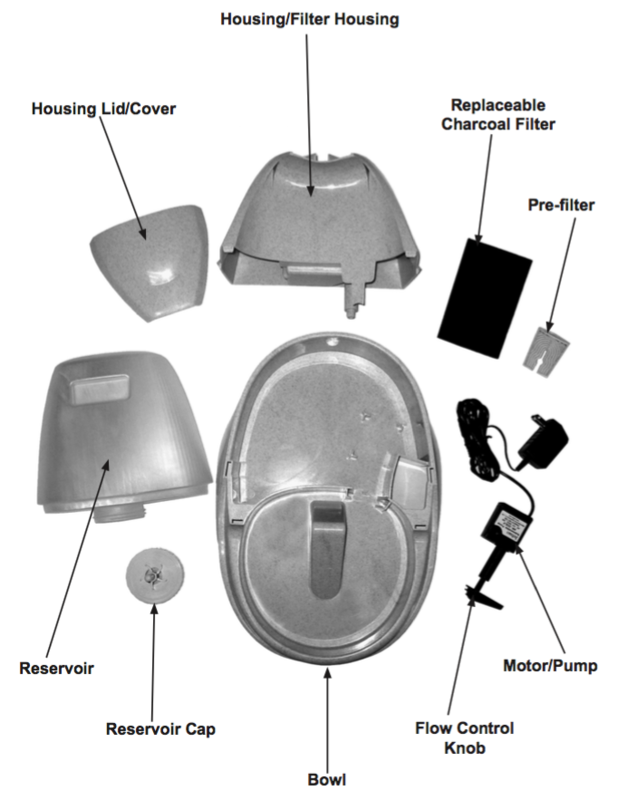 Based on a monthly filter change, the annual cost of replacement filters for the PetSafe Drinkwell Platinum Pet Fountain is $14 – $30. I have a very picky cat but he likes this fountain! He loves drinking from the free-flowing waterfall part, never from the bowl. Agree with the review: 1) the large reservoir capacity is a major plus and 2) the thing is a pain to clean. (Confession: I have never fully dismantled the pump motor to clean it but there’s been no overflow in >6 months of continuous operation… though I may take a look at that next time!) Overall this has been a really good purchase and I would buy it again.